Summer evenings mean late sunsets, lingering dinner parties, and sitting with friends and family around a grill or fire pit. 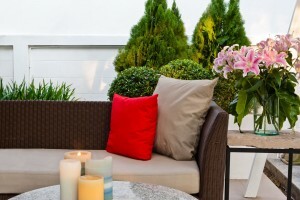 It’s the time of year when gatherings can move outside, and you can take full advantage of your home’s yard. Adding an outdoor kitchen is an excellent way to make the most of your outdoor space and truly enjoy summer. An outdoor kitchen is more than just a grill or a fire pit. You’re taking one of the most important rooms in the home and making an alternate version of it outdoors. You’re going to want to start with a foundation that can stand up to the weather. You certainly could buy a prefab grill island, but where’s the fun in that? Building your own outdoor kitchen island from stone or other materials doesn’t have to be hard. This outdoor kitchen guide breaks down the basics of how to build a grill island that will stand up to the elements while looking great. Grilling and cooking outdoors are almost synonymous, but when you choose a grill for your outdoor kitchen, you have a choice to make. Is this grill going to be powered by charcoal or gas? The debate over which types of grills are better is a fierce one, and good arguments exist for both. We won’t take sides here, but we’ll let you choose for yourself whether a charcoal grill or a gas grill is better for you. 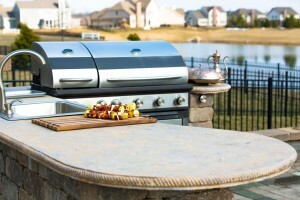 Gas grills are more common, somewhat more expensive, and heat up quicker. 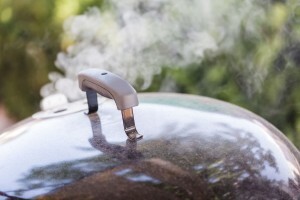 Charcoal grills, though, may impart some flavor to food during cooking, especially for things that take a long time to cook, like brisket or ribs. Other grill options, like electric or wood-burning grills, don’t have the intense following that charcoal and gas options do. Ultimately, choose what matches your budget and cooking style. Adherents to other grill styles might chime in about why you’re wrong, but it’s your outdoor kitchen, not theirs. While the grill is the centerpiece of any outdoor kitchen, it’s not the only way to cook outside. If you really want to take your DIY kitchen to the next level, add a smoker or a brick oven. Smokers can be either metal or ceramic. If you want to just buy a smoker, you can. There are plenty of good ones on the market. However, you also have DIY options. It’s possible to build a high-quality metal smoker yourself, but if you really want to emphasize the DIY angle of your outdoor kitchen, you could build a smoker out of a flower pot. That’s sure to start a few conversations at your summer barbecue. A wood-fired brick oven can add some rustic appeal to your backyard. Pizza is the obvious choice for an outdoor brick oven, but you can also impart some of that fiery flavor into meat, bread, or vegetables while adding a baking element to traditional barbecue fare. 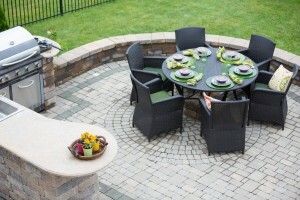 Finish off your outdoor kitchen with some decorative flourishes that make it yours. The classic American picnic table is a reliable standby, but you can also choose more upscale table and chairs to make your space feel more like an outdoor extension of your house. Proper lighting is necessary for those parties that go late, and good landscaping can help control the flow and feel of your yard. Do you have any tips or ideas on outdoor cooking? We want to hear from you! 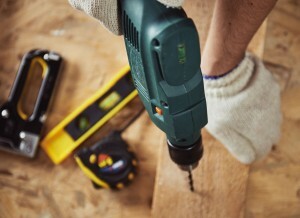 Get in touch with us anytime, or connect with us on Twitter and Facebook. Next Post: Do You Need to Be “Perfect” to Get a Mortgage?